Father George Gerald Christian, O.P. Provide comfort for the family of Father George Christian, O.P. with a meaningful gesture of sympathy. 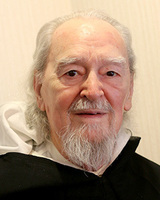 Father George Gerald Christian, O.P., died peacefully in the morning of Tuesday, April 2, 2019, at Rosary Hill Home, Hawthorne, NY, at the age of 90. Fr. Christian faithfully served the Church as a priest for nearly 65 years, working for many years as a psychologist in the public school system in Louisville, KY. He was very close to his brother Richard, who preceded him along with younger brother James and their parents. Father Christian was born February 19, 1929, in Woonsocket, RI, to George Emile and Meranna (née Arel) Christian and named George Emile, Jr. He attended St. Anne School in Woonsocket, RI, and was taught by the sisters of the Presentation of Mary. He attended Assumption Prep School in Worcester, MA, directed by the Augustinians of the Assumption. In 1946, he was accepted as a preparatory student for the priesthood in the Dominican Order at Guzman Hall, Providence College, Providence, RI. He entered the Dominican Novitiate in 1948, at St. Rose in Springfield, KY, and received the religious name Gerald. He made his first profession at St. Rose on August 16, 1949, and his solemn profession in Sea Bright, NJ, on August 15, 1952. He studied philosophy at St. Joseph Priory in Somerset, OH, followed by theology at the Pontifical Faculty of the Immaculate Conception in Washington, DC. On June 9, 1955, he was ordained a priest at St. Dominic Church in Washington, DC, by Most Reverend Jerome Daniel Hannan, who had just been named Bishop of Scanton, PA, the previous year. In June 1956, he was assigned to St. Vincent Ferrer Priory, New York, NY, and served as a parochial vicar in the parish. In February 1959, he was assigned to St. Stephen Priory in Dover, MA, where he served as procurator of the Priory and a teacher and counselor at local high schools. In May 1962, he enrolled in Boston University earning a Masters of Education in 1963 and a Certificate of Advanced Graduate Study in Counselor Education in 1965. In June 1965, he was assigned to St. Louis Bertrand Priory in Louisville, KY, and served as a parochial vicar and a psychologist for the Regional Educational Diagnostic-Treatment Center in Louisville. In September 1968, he enrolled in the doctoral program at the University of Boston, and completed his studies while continuing his work in Louisville earning a Doctorate in Education in School Psychology in May 1975. In September 1970, he was hired as a Psychologist for the Louisville Independent (Public) Schools, and moved to an apartment on Cherokee Road while remaining assigned to St. Louis Bertrand Priory. In August 1975, the Louisville Public Schools were merged with the Jefferson County Public Schools. Fr. Christian continued working for the combined school system until he retired in June 1999. Fr. Christian, along with his brother Richard, engaged in genealogical research and translated works from French into English. After retiring from his position in the school system, Fr. Christian continued this work producing many translations, particularly of the works of Henri-Dominique Lacordaire, O.P. In October 2014, Fr. Christian was assigned to St. Dominic Priory in Washington, DC. In October 2018, Fr. Christian moved to the Rosary Hill Home in Hawthorne, NY, where he received the loving care of the Dominican Sisters of Hawthorne. Fr. Christian‘s body was received in the chapel at the Rosary Hill Home at 5:00 pm on Friday, April 5, 2019. The Office of the Dead will be celebrated there at 7:00 pm. A Mass of Christian Burial will celebrated in the same chapel at 10:30 am on Saturday, April 6, 2019. Fr. Kenneth Letoile, O.P., Prior Provincial, is the celebrant, and Fr. Gregory Doherty, O.P., is the preacher. His body will be laid to rest in All Souls Cemetery in Pleasantville, NY. We encourage you to share your most beloved memories of Father George here, so that the family and other loved ones can always see it. You can upload cherished photographs, or share your favorite stories, and can even comment on those shared by others. I worked with George in Louisville. His ability to keep word to a minimum and his ability to put special education folders ‘on a diet’ were two talents that seemed to me his uniquely. We also can never forget that he always walked the 5 flights of stairs to our offices. Because I lived not far from him in the Cherokee Triangle, I often met both George and his brother as they walked the neighborhood gathering coins that the parting folks left behind.